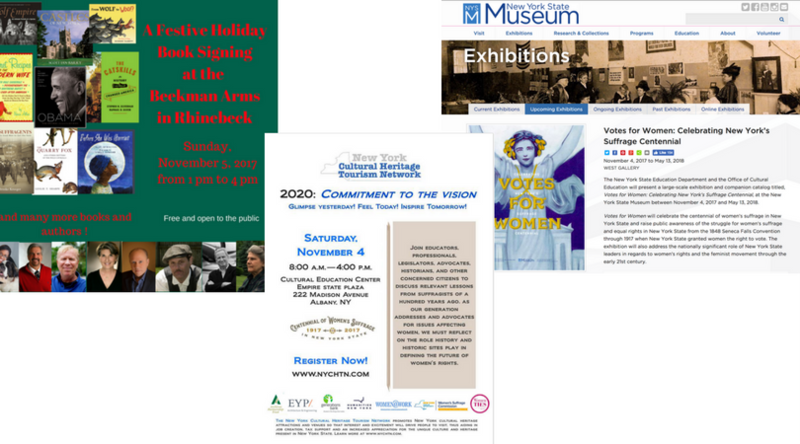 Saturday was the weekend’s main event so just a few highlights from a great day at the Cultural Education Center and New York State Museum at Empire Plaza in Albany. 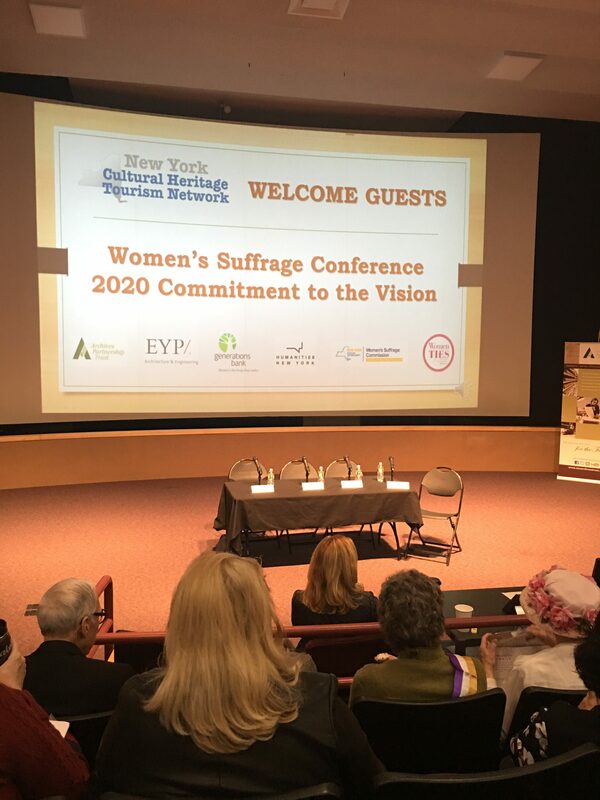 The New York Cultural Heritage Network sponsored the conference, the third in an annual series in support of the state’s centennial celebration, which goes on until 2020. Here’s the day’s program and sponsors, which I’ll follow with a few highlights, programmatic and personal. I ran into some of my favorite new suffrage friends. 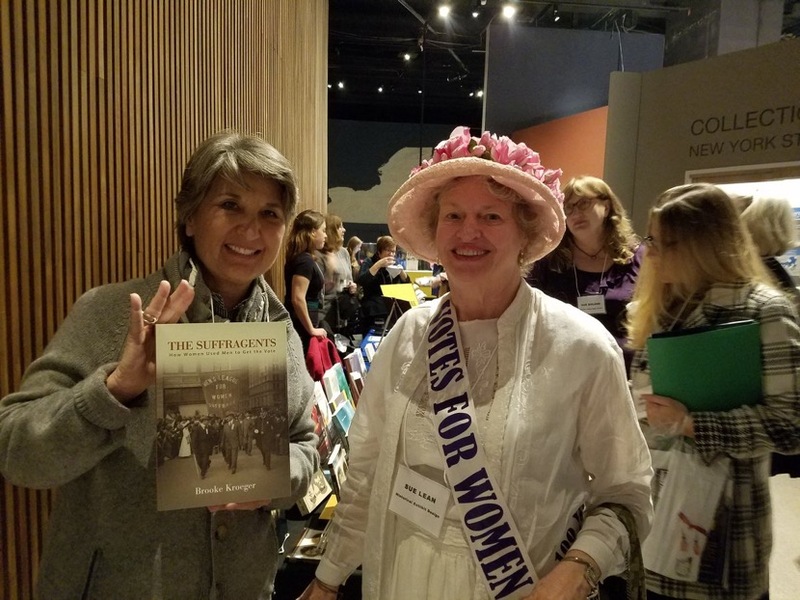 There was Coline Jenkins, who was our house guest in August when she came to East Hampton to march in the League of Women Voters’ suffrage rally re-enactment. 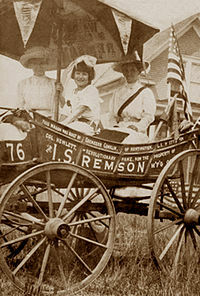 And I caught up with Marguerite Kearns, who was standing sentry at the suffrage wagon of her ancestor, Edna Kearns, now on display at the very front of the New York State Museum. Marguerite is a superb animator who also anchors the Suffrage Wagon Channel. 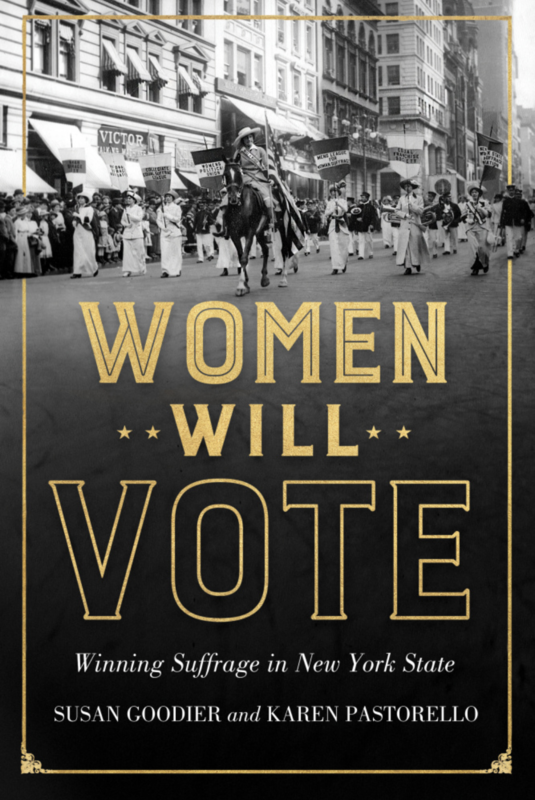 I finally met Karen Pastorello and Susan Goodier, authors of another of the new New York suffrage books, Women Will Vote. We hugged because we have been so much in tandem in these suffrage-heavy months, along with Johanna Neuman, author of the Gilded Suffragists. Organizers gave out the Goodier-Pastorello book as conference swag. 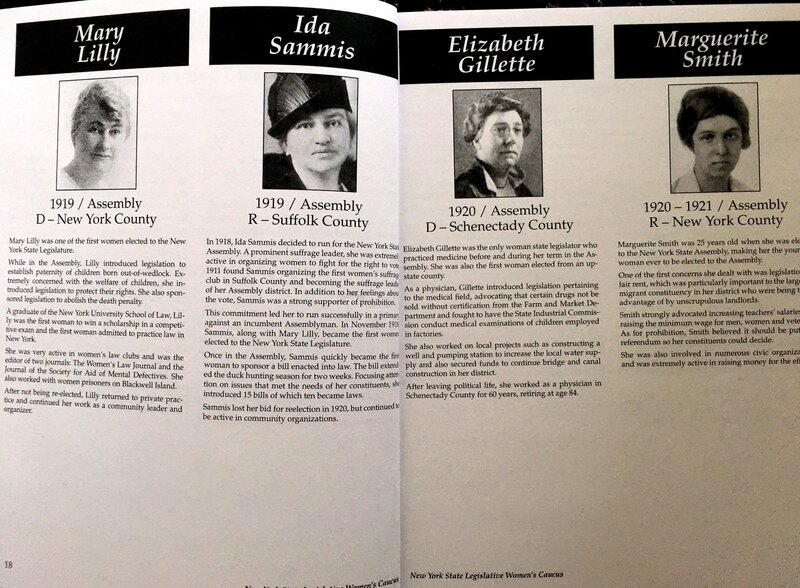 More swag came courtesy of the New York State Legislative Women’s Caucus in the form of a booklet that traced all the state’s women legislators through the decades. Here is the vanguard, two representing New York County (one, a graduate of NYU School of Law, just like Inez Milholland and Crystal Eastman, both Vassar grads), and one from Suffolk County and one from Schenectady County. 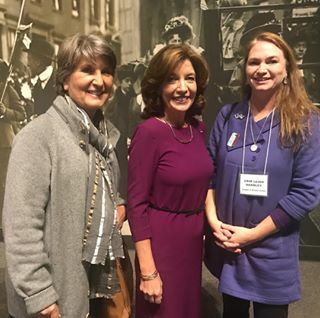 I enjoyed meeting Erin Leigh Carnley of the Matilda Joslyn Gage Foundation and the conversation we had with New York State’s Lieutenant Governor, Kathy Hochul (center), who spearheaded the 2017 suffrage centennial celebrations across the state. center, Lt. Gov. Kathy Hochul and right, Erin Leigh Carnley. 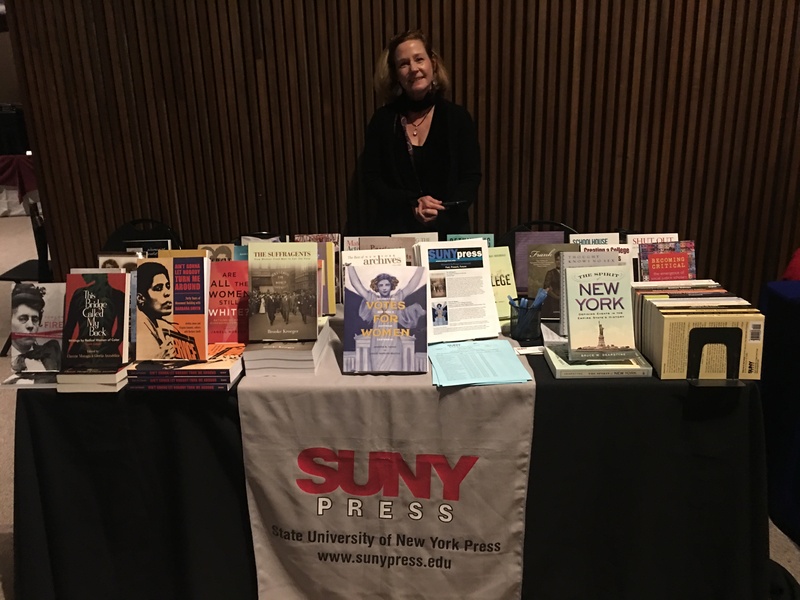 SUNY Press had a fine display, ably woman-ed by Donna Dixon, of all its current women’s history and suffrage offerings, including The Suffragents. At the display, I met up with a lovely woman from Olympia, Washington, in full period garb, who had been reading it. And it was nice to see that the State Museum Shop had copies of the book on display. 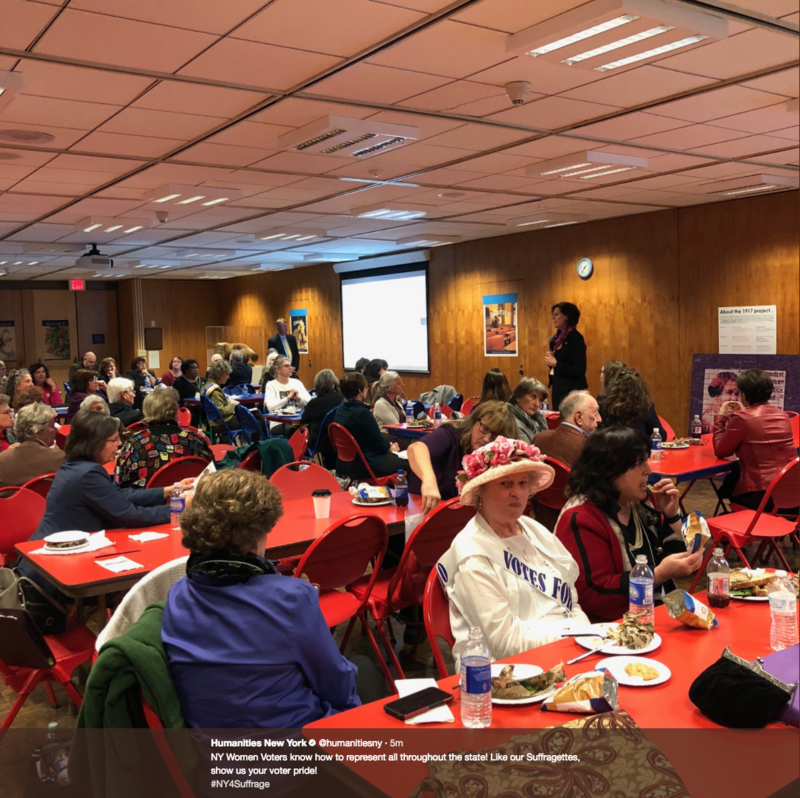 And we attended the sandwich lunch (I’m in gray to the right of the speaker, State Assemblywoman Patricia Fahy of Albany County). Beyond the tables, conference goers were painting tiles from patterns for the mosaics of suffrage stalwarts. This clearly took my attention as this photo was snapped. 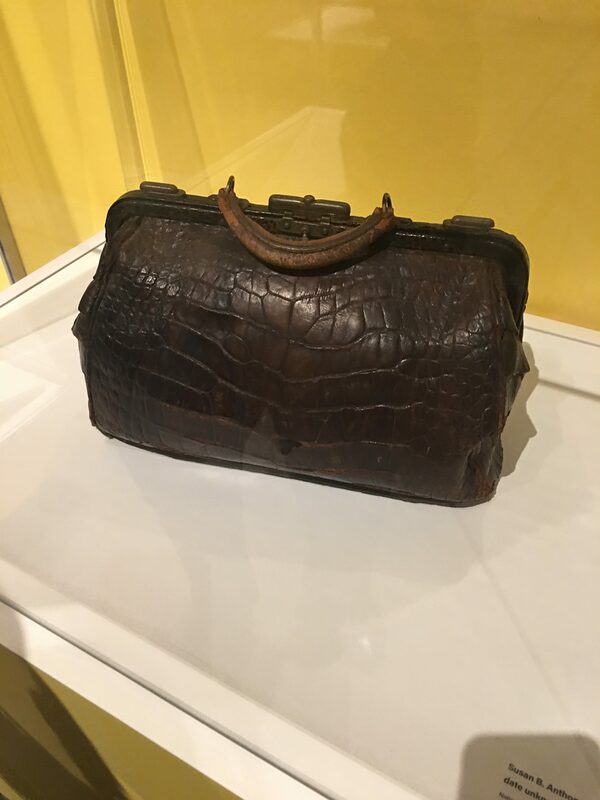 Susan B. Anthony’s alligator satchel. 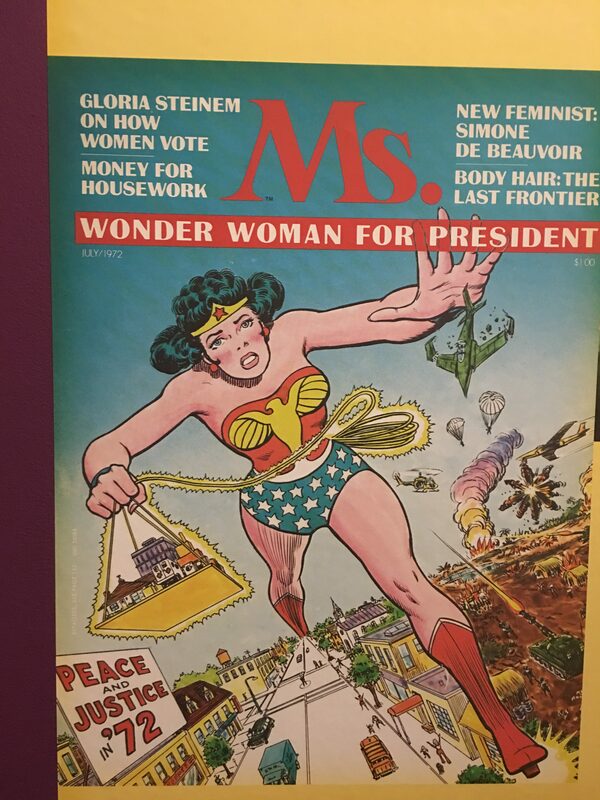 And tons of prized ephemera, including this one I took a photo of for one of my five granddaughters who has a powerful Wonder Woman affinity. Best of all were inspiring speeches from Lt. Gov. Kathy Hochul (this is she on NY1 talking through much of what she said in Albany) and from Sally Roesch Wagner, who received a sustained standing ovation. I wish I could share it because it was as fine a speech as I have ever heard. 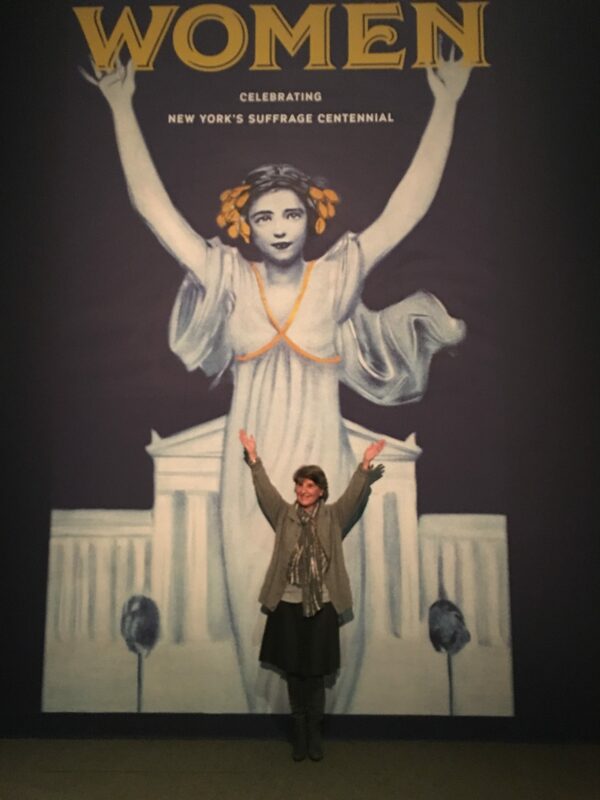 The weekend included a visit to the breathtaking Storm King Art Center and the amazing printing works of Thornwillow Press, makers of the sumptuously printed broadside of the Mission Statement of the Men’s League for Woman Suffrage that I offer with the books I personally sign to readers. 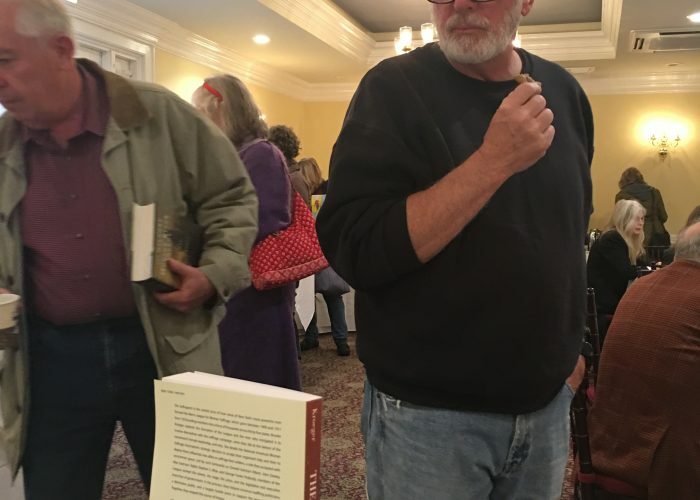 We met with close friends from Newburgh, Poughkeepsie, and Red Hook and for the “festive holiday signing,” I did what my wardrobe registers as tarting up, as you can see in this weekend recap in slides. 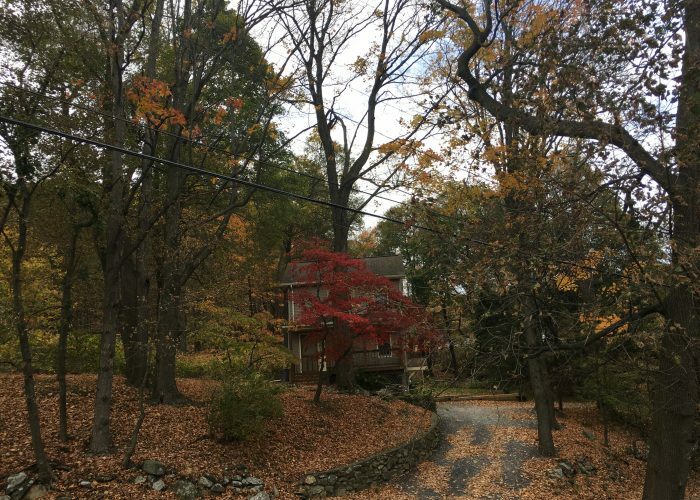 Thanks to our Hudson Valley pals and the foliage (at last!) for making it so fine. 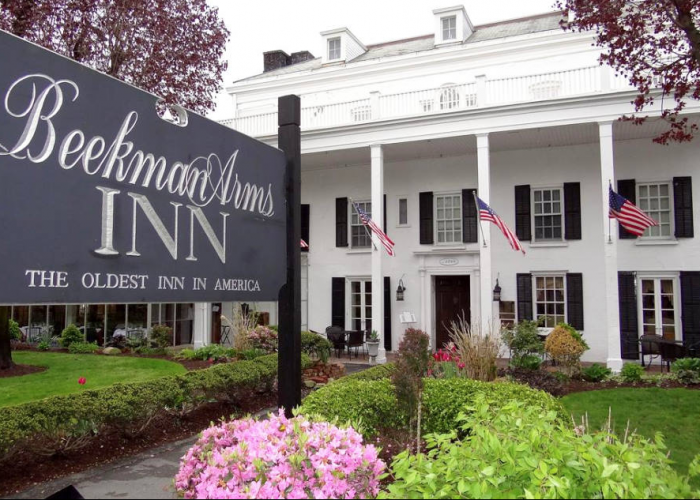 We started at the historic, as in 1776, Beekman Arms, checking in Thursday night . 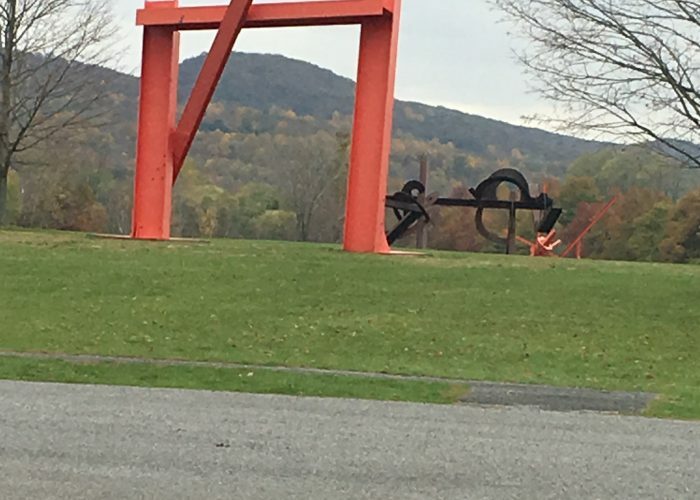 . .
Friday morning, we headed out for the Storm King Art Center but realized, passing Newburgh, we could stop in and see our friends Luke and Savine Pontifell at the headquarters of Thornwillow Press. 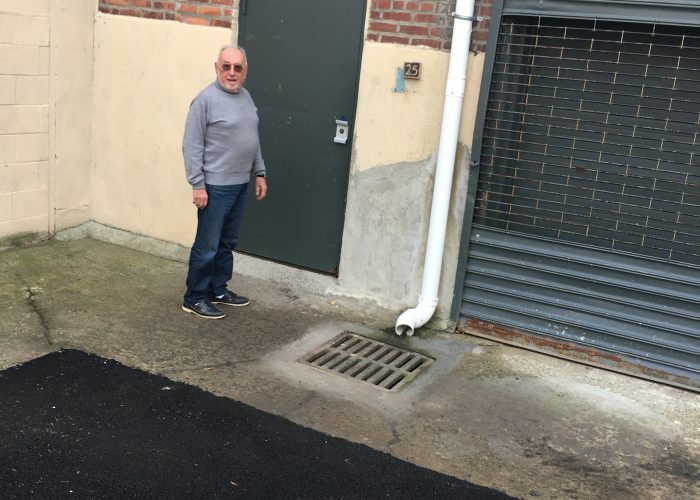 This is Alex at the very discreet entrance to a wonderland of fine printing amazements that seems to go on for acres. 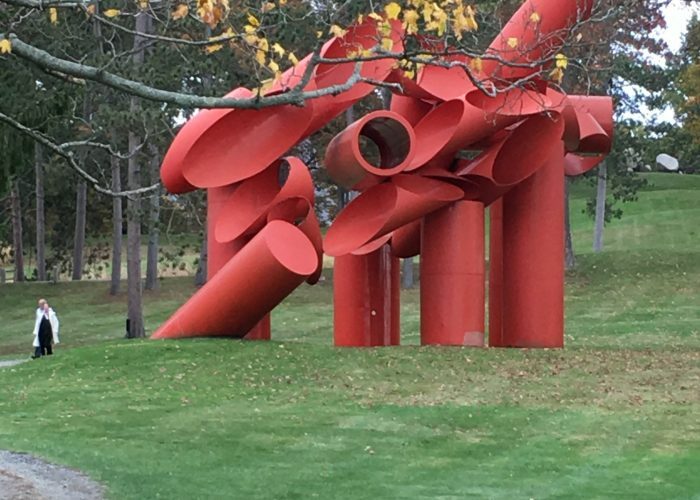 Just a couple of shots from Storm King. It was drizzling by the time we arrived there . . .
Friday night we were in Red Hook for dinner with Brett's mother-in-law, the wonderful Caroline Rider, and Eric. Saturday was an all-day Albany affairs as documented above . 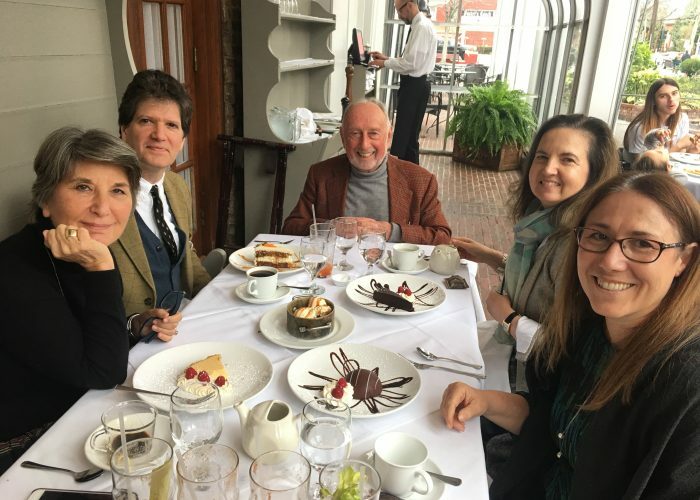 . .
and Sunday we had brunch with our Hudson Valley pals, Luke and Savine Pontifell from Newburgh and Giovanna Borradori, Vassar professor of philosophy. 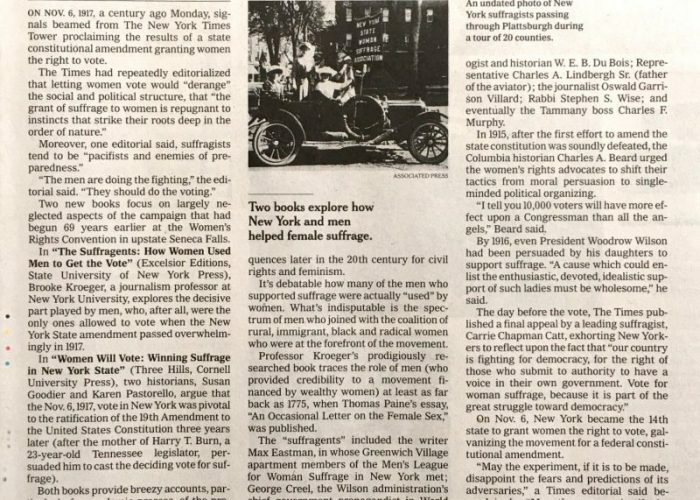 For the "festive holiday book signing at the Beekman" Sunday, it didn't hurt that the Sunday New York Times carried Sam Roberts' review of "The Suffragents" and Susan Goodier's and Karen Pastorello's "Women Will Vote." Crowd shot in the Beekman Ballroom. 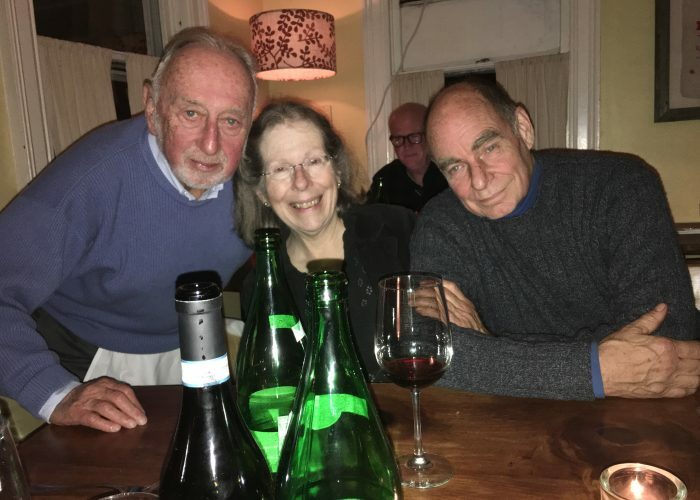 Ellen Messer and I couldn't quite get over how much our table mates to the left, authors Stephen M. Silverman and Mark Greenberg, resemebled each other, although they are not related. 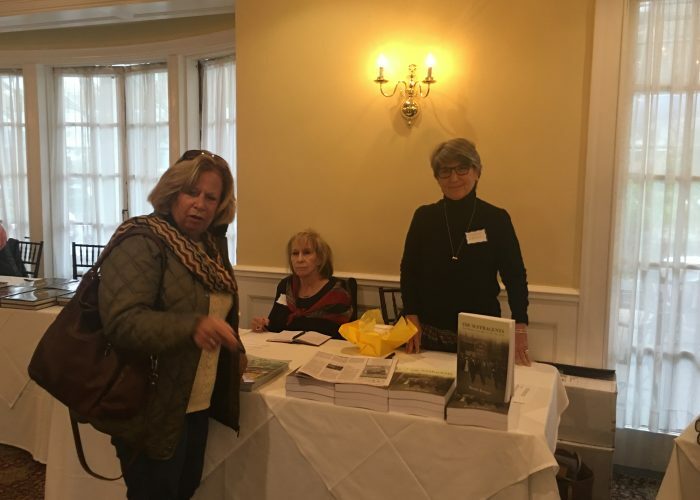 And here I am at my table with author Ellen Messer, who writes about back room abortions and the rabbi's cholent. 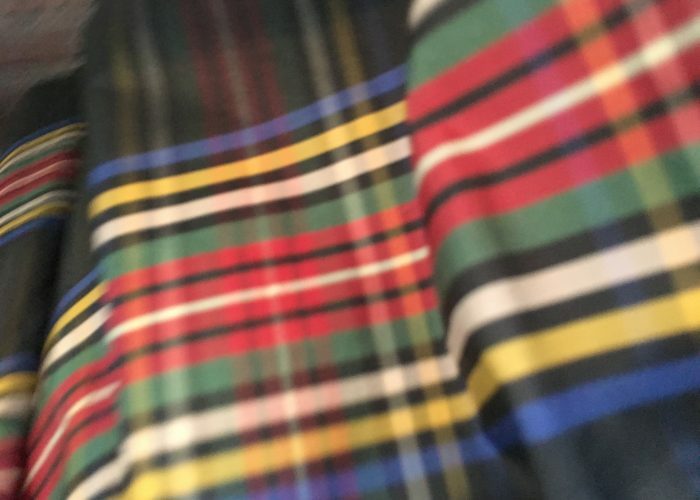 Please note I dressed in my impression of "festive" . . .
. . . as you can see from the plaid on my drop waist taffeta skirt. 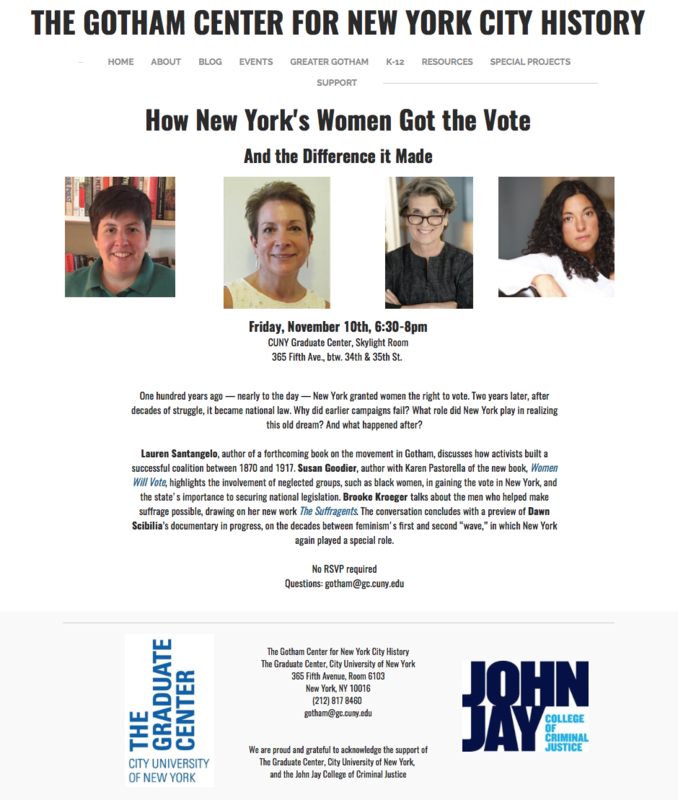 Incidentally, Susan Goodier and I both appear on a panel sponsored by the Gotham Center for New York City History on Friday, November 10, at the CUNY Graduate Center. We are in good company, as you can see below. 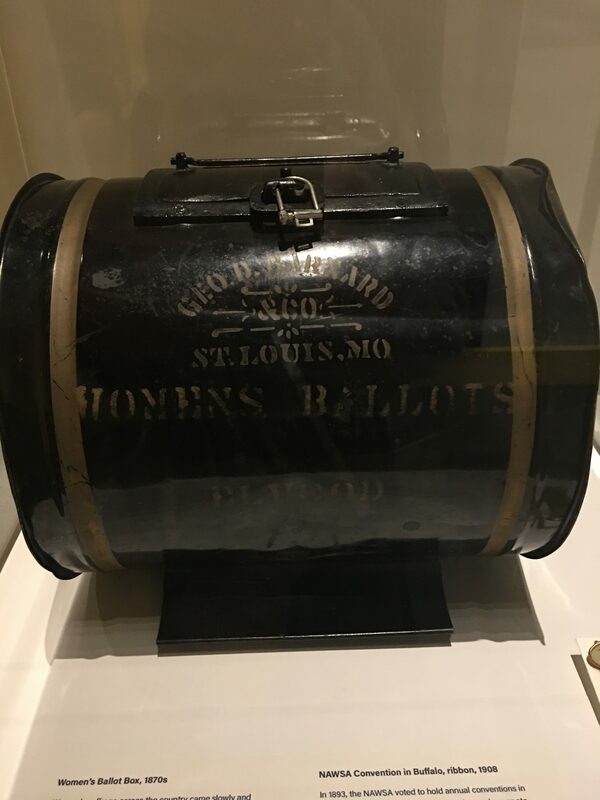 But even better than that, Gotham’s NYC history blog is running new suffrage articles every day during this centennial week. 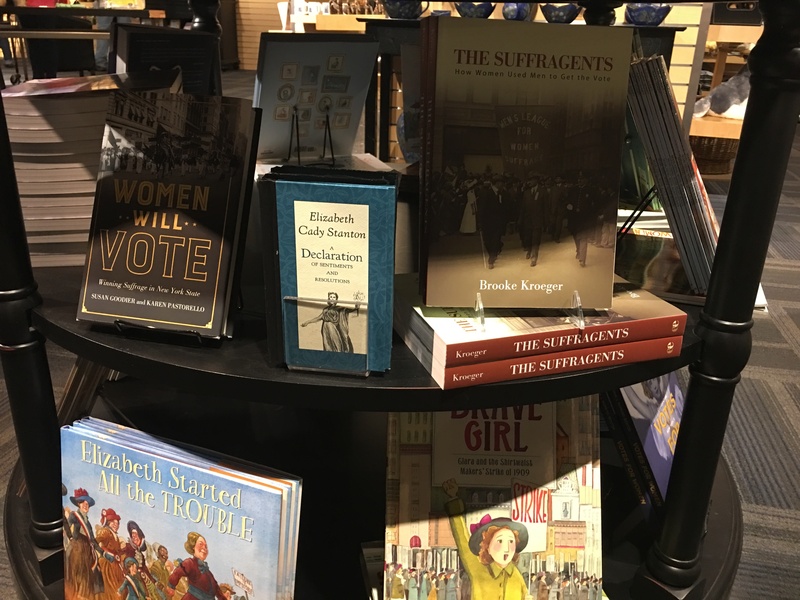 The weekend included a visit to Storm King and the amazing printing works of Thornwillow Press, makers of the sumptuously printed broadside of the Mission Statement of the Men’s League for Woman Suffrage that I offer with the books I personally sign to readers. 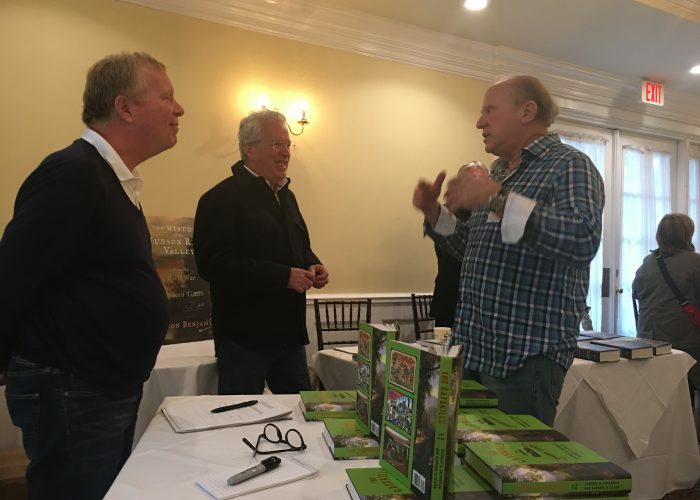 We met with close friends from Newburgh, Poughkeepsie, and Red Hook and for the “festive holiday signing,” I did what passes for tarting up in my wardrobe.